Éditeur : William M. Gaines Agent, INC.
EC Archives Weird Science Volume 3 (v. 3) est écrit par Variousavec un total de 212 pages et publié par William M. Gaines Agent, INC..
Two stories by legendary author Ray Bradbury, "The Long Years" (#17) and "Mars is Heaven" (#18), feature in this hardcover that reprints twenty-four stories by Al Feldstein and Bill Gaines, with art by legendary illustrators such as Wally Wood, Joe Orlando, Jack Kamen, Will Elder and more. Reprints Weird Science issues #13-18, originally published in 1952 and 1953. Introduction by Ray Bradbury. Weird Science Annual Vol 3 #11-14 Complete est écrit par Wallace "Wally" Wood et publié par Gemstone Publishing. A collection of the reprinted EC Weird Science comic book issues 11-14, including covers, advertisements and "Cosmic Correspondence" just as they appeared in the original comic books. EC Archives Weird Science Volume 3 (v. 3) (2008-07-24) est écrit par Unknown et publié par William M. Gaines Agent, INC. (2008-07-24). Weird Science #3 (Double-Sized Science Fiction Stories!) est écrit par Various Authors et publié par Gladstone Publishing le 1991. Weird Science issue #3. Gladstone publishing 1991. Eight classic Science Fiction stories. 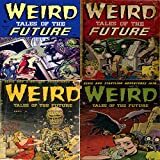 EC Archives Weird Science Volume 3 (v. 3) by Various (2008-08-04) est écrit par et publié par William M. Gaines Agent, INC..
Weird tales of the future. Issues 1, 2, 3 and 4. Eerie and Startling adventures. Golden Age Digital Comic Compilations Science Fiction est écrit par Digital Sky Comic Compilationsavec un total de 139 pages le March 12, 2015. Science Fiction comics from the 50's. Republished for kindle format. 4 IssuesEvery effort has been made to ensure that each comic is to the best quality as possible for the enjoyment of the reader. Due to their age and current condition there may be some comics that show signs of wear and tear such as marks, fading and small tears. In some cases advertising pages have also been removed. Weird Tales 1951 Vol. 43 # 3 March: A Black Solitude, The Mississippi Saucer, Old Mr. Wiley, Each Man Kills, The White Feather Hex, Dearest, The Invaders, Revenant (verse), Weirditties of Science (verse) est écrit par Dorothy (editor): H. Russell Wakefield, Frank Belknap Long, Greye La McIlwraith et publié par New York: Weird Tales 1st Edition le 1951. Inside And Science Fiction Advertiser / September, 1956. Henry Richard Van Dongen cover. With August Derleth essay on Weird Tales & part 3 of Lin Carter's H.P. Lovecraft piece. Vintage Science Fiction and Fantasy Fanzine est écrit par August Derleth, Robert Silverberg, Randall Garrett, Larry T. Shaw, Dave Foley, Edmond Hamilton, Jonathan E. Hoag, Charles Freudenthal, Dave Jenrette, William F. N Ronald L. Smith (editor); Lin Carter et publié par Ronald L. Smith.